If you’re here reading this right now, chances are good that your computer is old. Maybe it’s a little slower than you’d like. Even though you’re attached to the old girl, you suspect an upgrade is necessary. You look at our SolidWorks Hardware Requirements and Mastercam Hardware Requirements and confirm you need an upgrade. But you’re in a predicament: it’s time for a new workstation, but your budget is, shall we say, prohibitive. Luckily for you, there’s a way to keep your beloved Dell or HP workstation and get that new computer feel. The SolidBox Refresh program offers you the chance to hit the refresh button on your older workstation. Send us your desktop or laptop manufactured after November of 2014 and we’ll perform all of the necessary updates. Furthermore, we’ll even make suggestions about possible hardware upgrades to help you get the most out of your machine. With the SolidBox Refresh, your trusty workstation receives the same integration that we perform on every new SolidBox that comes through our lab. This integration is a comprehensive process designed to maximize the performance of each individual setting and component in your workstation to allow more efficient communication between them. 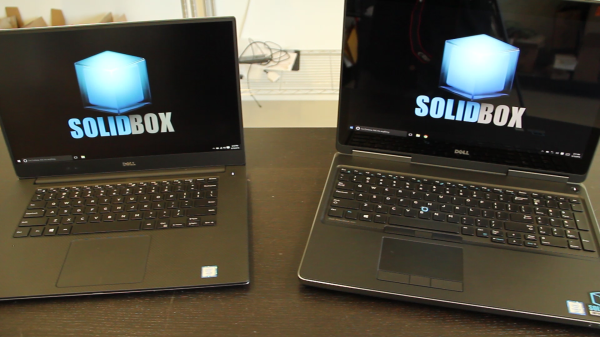 The SolidBox Refresh program is also an excellent opportunity to upgrade outdated hardware. We all know that today’s freshest technology can be obsolete tomorrow. Upgrading just one three-year-old component can make a huge difference in performance. After inspecting the results of our post-integration benchmarks, we are able to diagnose specific components that would greatly benefit from an upgrade and discuss those benefits with you. Any upgrades you purchase will also come with a 15% discount off of the market price. So for a tenth of the price of a new system, you will receive all the benefits and performance of a new SolidBox. With a SolidBox Refresh, your old Dell or HP will work better than the first time you pressed the power button. It may look and feel like your old gal, but it will run like a SolidBox.